Cricket’s Slice Of Life this week brings many emotions to the fore. She asked us to write about our earliest childhood memory. This ended up being quite a heartfelt one for me…..
It’s what separates the me I am now from the me I was –the passage of time. Sometimes I stand in the garden as night falls and gaze, thinking of the thousands of hours that have fallen into the cracks of my memory, most of them plummeting too deep to recall. The camera holds such power. How can an object with no life force of its own hold a moment in time just as it was? We look right into the lens, laughing, crying, turning our heads with the surety of our existence, not contemplating for a moment that one day we will look at this image, this photograph, from our place in the future and possibly weep for what once was. I have such a photo. It is a photo of my earliest memory. I am not sure if it is my earliest memory because I have the photo to trigger it or if the memory is strong enough to stand alone without the photo as stimulus. Either way, the photo and the memory are intertwined forever in my mind. I was about two years old. My mother had dressed me in a pale lemon dress with a tiny broderie anglaise petticoat underneath. I had on the red leather lace-up shoes my Aunt Nellie had brought me back from France and had spent the morning infuriating my mother by repeatedly undoing the laces. Being only two years old, I couldn’t tie them back up again, so every five minutes or so my mother humphed and grumphed her way to tying them back up again, worried that with loose laces I might fall on my face which would never do because I was about to get my photo taken. My grandmother had organized it. That’s her right there in the photo with me on her lap. She was a staunch, fierce woman; a matriarch in the true sense of the word. She was only five foot tall but has been one of the few people I have met in my life who could say: ‘If he messes with me, I’ll eat him for breakfast’ and mean it. She called me her little doll. Or wee doll, being Scottish. I called her Doll- Gran. She had a jewellery box that played Somewhere My Love (the theme from Doctor Zhivago) when you lifted the lid. It was full of her necklaces and rings. I imagined she must be the richest woman in the world to own all those jewels, or that perhaps she was a Queen of a faraway land. She was wearing one of my favourites in the photo – her amber necklace. It was the colour of thick-cut marmalade and autumn leaves. Sometimes, if the light caught it just right, it was gold in the centre. My Grandad is sitting next to her. A quiet gentleman who opened doors for ladies and took your arm as you crossed the road. Like so many men in Glasgow at the time, he worked down at the docks on the River Clyde. He used to tell me stories about boats headed for London or France filled with secret cargo. I remember how well-pressed his suit was, his Sunday best. Doll-Gran wouldn’t let him sit down before the photo was taken in case he creased it. The photographer wanted to take my teddy away, but that teddy and I were joined at the hip. No one took Ted away from me. No one. 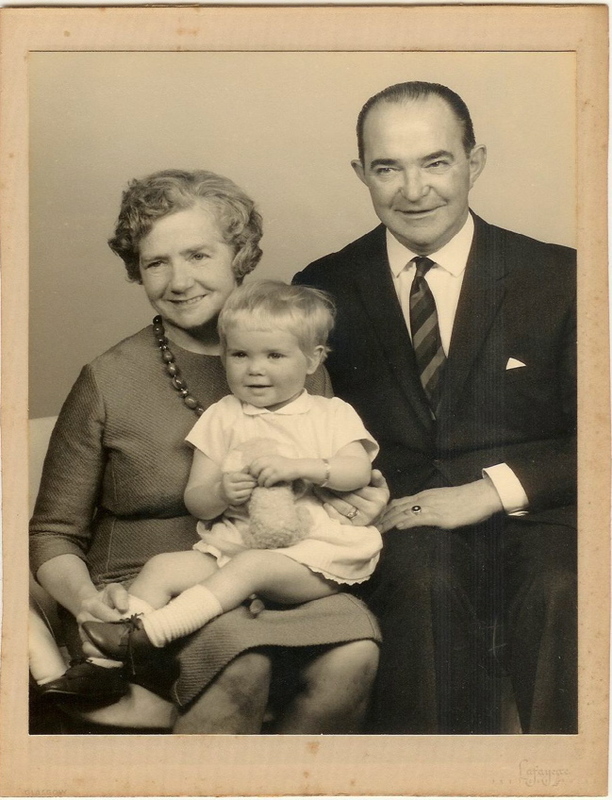 So Ted – as my mother had expected all along – became memorialized in the photo. Afterwards we sat in the park and ate vanilla ice cream cones with raspberry sauce topping. I disgraced myself by spilling a big blob of the crimson sauce on my yellow dress and untying my shoelaces again. It’s difficult when you see a photo of yourself taken forty years ago to imagine that the young child in the image is in any way connected to you. There are shades of familiarity, nuances, iridescent, fleeting, but there is not the huge jolt of recognition you get when you look at yourself aged ten, sixteen, twenty, thirty. It’s even more difficult to acknowledge that the people in the photo with you are gone, no longer present in this world, that you cannot turn around to them and say: ‘Remember that day when we got the photo taken and I wore my new red shoes?’ It seems wrong that they are gone and you are still here, a mere ten years younger than they were when the photo was taken. Time. It’s hard on the heart. Sometimes it can seem like cruelty to bear the weight of it. It lets none of us slip through its silken grasp. Once upon a time I was that little girl getting my photo taken with my grandparents, clutching my teddy bear. Once upon a time I was present, living in that moment, not just remembering it. Once upon a time I was safe, wrapped in the tenderness of their love. They are gone now, my dear Doll –Gran and Grandad, but as long as I can remember them, they will always be with me. How bitter sweet childhood memories are,and how nice that these are the memories that remain with us when we get older, even though we might have a problem with remembering recent things. Selma, this is such a beautiful slice of your life. I sometimes look at photographs of my grandmother and weep from the pain of missing her. I would love to have one more day with her. So beautifully written; so incredibly touching. I can relate to this story more than I can say in words. I know exactly what you are saying Selma about remembering times past, loved ones gone and how the camera and old photos telling so much. YOu were a lovely little girl. You are an amazing woman now. What a wonderful description of what a photo really means to us. Sad really but sometimes I think how would life be if we never died. Don’t we squander abundance like that? The limited time is what makes life so valuable. Unfortuntely most of us can’t quite hold that thought for very long in the present, it is far too painful and so we amble along as if we have forever with the ones we love. We lie to ourselves until the truth forces us to pay for it. What a beautiful essay, Selma. Just the other day, I found a packet of photographs and started looking through them. The kids were so little then, and I remember thinking how tired I always was, just trying to keep up with them. I remember dealing with depression and wishing they were just a little older so it would be easier. Now… I wish I could go play cars in the dirt with the little boys, or go snake-hunting in the long grass with Spawn. Memories can be a double-edged sword, cutting us to the quick with regrets and the passage of time, or warming our hearts with visions of happy times. DIAMONDS – they are bittersweet, aren’t they? But it is so nice to remember. I think looking at old photos reinforces who we are and where we came from. And it’s important to remember that. Great to hear from you. Hope you’ve been well. CRICKET – I know. It is so hard. You will see her again one day though – I am sure of it. This was such a good prompt. I actually feel cleansed after writing about it. Thank you. GERALDINE – the emotions triggered by looking at old photos are difficult to put into words. So many things flit through your mind. Sometimes if I am feeling vulnerable I just can’t bring the old photos out. But at other times it is nice to remember. I know exactly what you mean. LAURI – how wise you are. It is the limited time that makes our lives so valuable. Oftentimes, we take things for granted as if we are going to live forever. We should appreciate every day. It’s difficult to do though, isn’t it? We humans always seem to be looking forward, keen for the next adventure. KAREN – Oh, Karen. I feel the same way. I remember feeling so tired when Nick was little, longing for him to be more independent so I could have more time to myself. Now I think of those years when I used to play matchbox cars with him or build towers from lego as being golden moments. Funny how our perspectives change. I see people nowadays photographing or video-ing their childrens’ every move, and wonder how much of it it going to survive into the child’s adulthood. All of it? None of it? Or, just the best of it? You see, when I was a child, my parents would use only one 12-exposure roll of film a year (Christmas at each end, and holidays in the middle, as the joke used to go) And, it was pretty poor-quality stuff … the people in the picture could be anyone. The stuff that did survive is the professional, more formal stuff, taken on special occasions. The one that did surprise me was finding, in the ‘family archives’ (my cousin’s spare room) a photo taken around 1917 of a very dashing, handsome Army Major. Janet and I had to inspect it very carefully before realising it was our Granddad! Such memories are excellent at giving us a reality check regarding the present. They remind us that things can get better – that people lived who cared, and as long as you have memory of them, you’re never alone. TRAVELRAT – I have some friends like that. They have so much stuff recorded they never have time to watch it all. The story of your handsome Granddad is a wonderful one. I love discovering photos like that. ANTHONY – oh absolutely. We need those reminders from time to time, I think. this was a real tender slice of life selma… all of my grandparents are gone now too,, and the memories of them are something i could never bare to lose…. What a wonderful memory. I always felt safest when I was with my Grammy as a child. I love that Ted was immortalized. Anything that vital to your happiness at that time should have been! Thank you for sharing such a sweet memory. I might write about this prompt, if that’s okay. My first memory came flooding back to me as I began to read your post. PAISLEY – thank God we have our memories. I wouldn’t give them up for anything(even the bad ones). EPIPHANY – Oh please write about this. I am so interested in how far back people can remember. I have a friend who remembers being 6 months old and watching the mobile above her cot and another who can’t remember anything before age 6. I’ve had a pretty good weekend watching the Olympics. Hope you’re enjoying yours. Oh. I just love how you let us right into your heart with your words Selma. DAOINE – oh yay for Wally. I still have my Mr. Ted. Teddies are just such wonderful toys. If I ever get a really big house I plan to collect bears. I just love them. So glad Wally was immortalised too! Lovely photo, lovely story. I KNEW your grandparents were Scottish, even before I read it. Your grandmother looks just like my husband’s Auntie Jessie! You write so beautifully, Selma – there’s an award for you over at The View From the Pond – come on over and we can chat about the West of Scotland! PUDDOCK – they do have that Scottish look, don’t they? My Grandad’s sister was called Jessie. I am so thrilled about the award. You really are very kind. And I’ll take you up on that chat!